What environments typically prefer metal toilet partitions for commercial restrooms? Clean environments, as many call them, prefer stainless steel for its super hygienic qualities. Stainless steel is non-porous. Because it blocks the absorption of water, bacteria do not have time to breed on its surface. The material is remarkably easy to clean—so easy, in fact, that many people have to be reminded to only use warm soap and water to wipe the surface down. Stainless steel toilet partitions are popular in hospital restrooms, medical clinic restrooms, and food processing plants for this reason. Crews can go into the restroom several times a day and wipe down the partitions in only a few minutes. This minimizes labor costs and keeps the facility clean throughout the day. There are also many organizations that prefer the attraction factor that metal partitions add to commercial restrooms. A large percentage of new restroom constructions and remodels feature an upscale look, a contemporary/modern look, or a blend of the two. Stainless steel features a unique aesthetic that many could describe as a blend of the chic and the minimalist. As such, it contributes sophistication to more formal bathroom designs, but it contributes a sense of less-is-more when surrounded by contemporary and modern designs. This makes it something of a universal material in the world of restroom build outs. 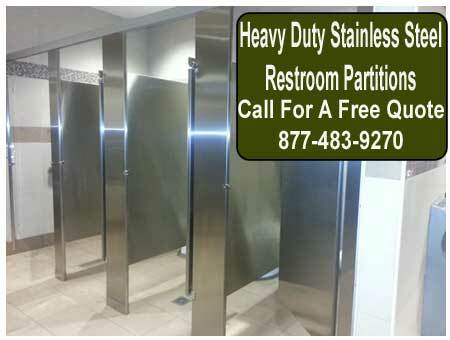 How durable are Bradley stainless steel toilet partitions? They are exceptionally durable due to two unique features of their construction. For one thing, panels feature a seamless construction that is created by bonding two separate metal sheets together. The interior of each sheet consists of a water-resistant honeycomb surface that enables sheets to tightly fit together. The panels are welded around the edge to create the Bradley trademarked Permaseal design that makes the entire length of the edge, along with all four corners, absolutely impervious to moisture. Are stainless steel toilet partitions environmentally friendly? The newest generation is. Along with many other materials that Bradley uses to make toilet partitions, stainless steel is now GREENGUARD Certified as a low-emitting substance. This allows facility managers in charge of LEED projects to take advantage of the physical and aesthetic qualities of stainless steel and still remain compliant with new, environmental awareness and building requirements. What mounting styles are metal toilet partitions for commercial restrooms? They can be mounted to the floor, ceiling hung, floor to ceiling mounted, or floor mounted overhead braced.